After surviving my Engineering years , I now realize that my nose too survived. 'Survived' is a word too small as compared to the type of smells and stinks that my nose got hold of. 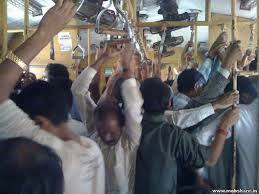 Thanks to the Mumbai local commuters of the second class bogie and the Indian railways. I don't know how to thank them enough for sharpening my olfactory organ's function. My brain would rejoice. I would have served the Mumbai police better than the sniffer dogs. Hah! Of course I am kidding. Every day when I stood there at the Kurla Railway station ( the Filthiest ever in Mumbai) exhibiting my innocent face, a thousand thoughts wandered across my mind. I never had any issues with boarding the jam packed bogie. No, I never had! Of course all I had to do was to stand in middle between the crowds consisting of the stocky men with unwashed craggy faces and tobacco stained teeth who would automatically ferry you inside the train free of cost. What perturbed me was how I could sustain the 30 minutes train journey. Being squeezed inside the train was not a matter of concern. What mattered the most was how would my nose react to the smell of the sweaty arm pits and unbrushed teeth and bad breath of my fellow passengers. Bad Odor, in fact very bad! I realize that not much damage must have been caused in Japan when America bombed it during the WW2 than what I faced everyday during my Engineering days where I had to travel by the Mumbai local. A guy from the other corner of the bogey would pass a silent fart. Purrr.... some less audible and some like sound of a cracker that is burst during Diwali. Their fart would be so powerful that it will reveal what they ate the other evening. No, if you are thinking that I am a fart analyzer then you are wrong. I only analyze software quality. :D Trust me! Everyone would stand there displaying their puppy faces. No one would ever react to it. If someone did then the ACP Pradhyumans and the Dayas travelling inside the train would look at them suspiciously. And squeezed between the crowd I would helplessly try to move my hands to clip my nose. But all my attempts to do that would eventually remain futile. Out of frustration I would bury my face on the back of the guy standing in front of me. 'Oh God! Some guy farted,' The guy standing besides me would mumble. While doing so he would get his arm pit close to the area around my nose. Oh no! Don't! I would want to scream. "Haa!" I would say with a straight face. A group of small miniature birds would parade around my head when the train reached Juinagar. That was the time when most of the stinky nasty smelling dudes would get down. A silent tears of happiness would copiously roll down my sweaty cheeks when I get down at the Nerul that shelters my Engineering college. I would want to do a pelvic thrust like legendary Mithun Daa. Of course, I never wanted to be the apple of all eyes so I would refrain from inviting any kind of unwanted attentions. For four years in my Engineering college, I also served the role of being the love guru. Guys knocked my doors to seek love ideas. Of course, I was adept at giving nice ideas. One day a dude from the Electronics department asked me for some love tips. I gave him some nice idea but the very next day he came running towards me like he was going to bash me. I investigated and learned what exactly happened. I realized that he belonged to that league of dudes who showered once in a week in a city like Mumbai that is cursed by the Sun dearest. 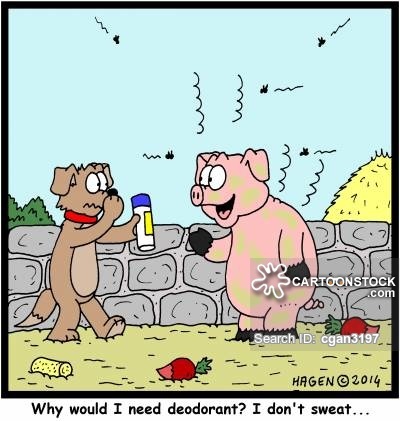 I took him for a stroll and advised him to shower everyday, brush twice a day and use a nice deodorant. He snapped back and showed me a very ugly look. What! Hah! Dude, be clean! Bad Odors are a big turn offs. The irony was that being the love guru I never had any girlfriends. Oh yeah! all the girls whom I eyed were already taken. The grapes are sour! Your post is hilarious. I can empathize with you because very often, our noses also get assailed with all kinds of odours that refuse to die down. I only people with body odour would pick up a deo. :) Unfortunately, often such people don't realize that they have a problem.